And then there was the fog. Did you see it on Sunday night? I wondered how Al Michaels and Cris Collinsworth saw the field in the New England-Atlanta game, but I think we all witnessed enough to know the Patriots are still the Patriots and the Falcons … well, they’re somewhere in the great middle of the league right now, the same way Carolina was last year after suffering a crushing Super Bowl loss. Atlanta’s not very good. But hey, neither is the vast majority of the league. Nothing happened to lift the fog over the pennant races Sunday, except that we found out Brett Hundley is going to have a very tough time keeping the Packers in the hunt, Arizona’s out of it, Denver’s offense is awful and the Colts are playing like they want to get their coach fired. And one other thing before we get to the weirdo Falcons, and to the revival of the Dolphins, and to the end of football’s Ripken streak, to craptastic football in London, to a career-altering game for Derek Carr and other stories. First, to a meeting at a Jersey City, N.J., hotel that, in light of current American and football events, you should know about. Now for some football, starting with that Fog Bowl. Last year, every time I heard somebody with the Falcons—head coach Dan Quinn, quarterback Matt Ryan, others—say, “We’re aggressive, and we’re not going to change our style,” I used to wonder why. In the Super Bowl, when the Falcons should clearly have been in the business of bleeding the clock in the last 20 minutes, they kept being aggressive. After the game they talked about how they’d played that way all year, and they weren’t going to change on the biggest stage. How’d that turn out? 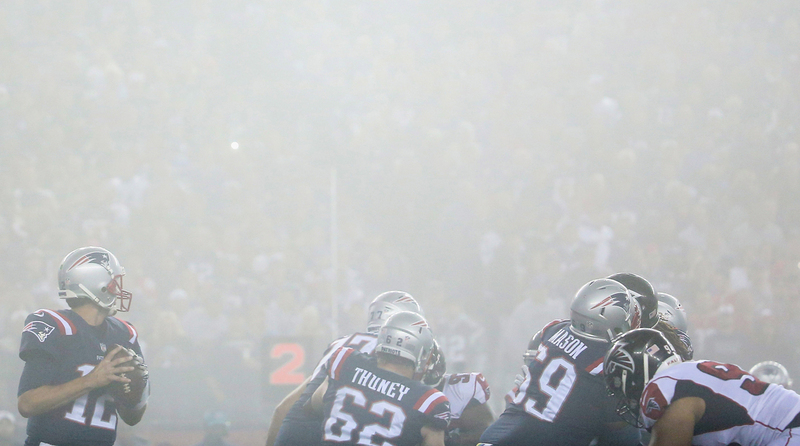 A foggy night in Foxborough made an interesting backdrop for a Super Bowl 51 rematch, won again by the Patriots. And how’d it turn out Sunday night? Why did the Falcons go for it on fourth-and-seven late in the first quarter Sunday night at New England? “Dan Quinn has seen enough of those 28-3 signs,” Cris Collinsworth said on NBC. “On the highways, on the rings …” Atlanta converted but didn’t score. Aggressive, aggressive, aggressive. I bet you a year’s supply of Legal Seafood chowder that the Patriots are in their offices today, watching the film of their easy 23-7 win and saying something like, “How great is it that we forced them to be desperate, and to make all those mistakes?” Bill Belichick lives for teams to change their styles because they’re playing the mighty Patriots. And that’s what the Falcons did Sunday night. Going for it twice in long-yardage situations, knowing you were giving Tom Brady a short field if you fail? If it’s such a brilliant gambit, why don’t Quinn and offensive coordinator Steve Sarkisian do that every time when it’s fourth and six or eight near midfield? I want my coaches to be smart more that I want my coaches to be aggressive. One more thing: Atlanta’s offense is not in a slump; it’s in crisis. The Falcons are scoring 12.5 points per game less than last year. Matt Ryan had a plus-31 TD-to-pick differential in his MVP season last year; it’s plus-one this year. Last season they scored less than 20 in a game once. This team has 17, 17 and 7 in its last three games, respectively. Maybe Quinn should yank play-calling from Sarkisian. I can tell you with certainty what the Falcons should do, regardless who’s calling the plays: Give the most efficient running game in football more than the 22.5 carries per game Devonta Freeman and Tevin Coleman are getting. That number should be 30, easily. The season’s slipping away. Quinn better lasso it … and be smart about it. Coming off the bench in the third quarter, Matt Moore finished 13 of 21 for 188 yards, two touchdowns and an interception to help the Dolphins beat the Jets 31-28. • Beat the Chargers in Los Angeles when Younghoe Koo missed a 44-yard field goal with five seconds left that would have won the game, after the Dolphins decamped to California to avoid the hurricane that strafed Florida. • Got embarrassed by the Jets, 20-6, in New Jersey. • Got embarrassed by the Saints, 20-0, in London. Football is a funny game. Then Miami won ugly over Tennessee 16-10. Then Miami fell behind Atlanta by 17 at the half and scored 20 unanswered to grab a 20-17 win. Then, on Sunday, Miami trailed the Jets by 14 after three quarters, lost starting quarterback Jay Cutler to a chest/rib injury, and backup Matt Moore led the Dolphins to 17 fourth-quarter points. Miami 31, New York 28. Not just a Miami win, but one that could result in some quarterback questions. Cutler was getting an X-ray and possibly an MRI on his chest/ribs area Sunday night. With a Thursday night game looming at Baltimore, coach Adam Gase might have a decision to make. 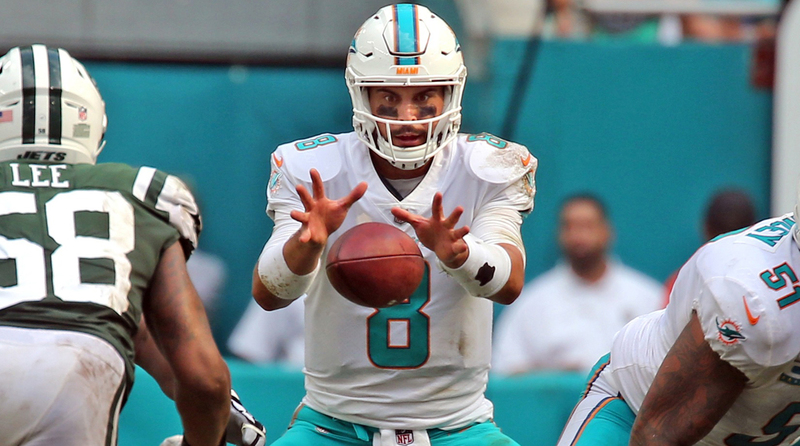 If Cutler, the hand-picked quarterback Gase brought out of retirement when Ryan Tannehill was lost for the season in training camp, had some damage that would need healing time, Moore would certainly play against the Ravens. But if Cutler is okay to play, whom would Gase choose: Cutler, who’d led Miami to a puny average of 10.5 points per game in the four games before Sunday, or Moore, who brought a spark to the offense and led Miami to 17 points in the last 13 minutes of a game they looked to have no business winning?. Armando Salguero of the Miami Herald reported Sunday night the team believes Cutler suffered cracked ribs and could miss at least one game. But we’ll know the medical results Monday, and the quarterback situation will be clear then. Wideout Kenny Stills, who caught the two fourth-quarter touchdowns that tied the game, tried to explain. Moore threw a pick on his first full series on an aggressive throw downfield, leading to the Jets’ final touchdown. But on his third series, Moore hit Stills perfectly down the right side for a 28-yard score. And midway through the fourth quarter, he capped a 54-yard drive, under some heavy pressure throughout, with a two-yard scoring throw that Stills nabbed, Beckham-style, one-handed in the end zone. There might be better teams in the NFL this year than the 4-2 Dolphins. But there aren’t many with higher highs and lower lows. It’s going to be a fascinating final 10 weeks for this team. Derek Carr of the Raiders had such a fabulous, ridiculously clutch final drive on Thursday night, and I cannot let it pass without paying homage to the 26-year-old quarterback. This drive could become a defining moment in his ascending career. Think about what Carr did 18 days after breaking three bones in his back, with the Raiders’ season on the line, trailing the no-doubt best team in the division—Kansas City—by six, with 1:47 left in the game, on second-and-20 from the Oakland 20. At that moment, the Chiefs were 5-1, with a three-game lead on the 2-4 Raiders. What made the situation more dire for Oakland: Games away from home loomed against Buffalo, New England (in Mexico City), Kansas City and Philadelphia in the last 10 games. A fifth loss, and the playoffs would be nearly an impossible dream for Oakland, as Romo said. • First throw, second-and-20, Oakland 20, 1:47 left. With cornerback Terrance Mitchell singled against Amari Cooper in the left slot, Cooper ran a skinny post, trying to bisect two deep safeties. About 10 yards into his route he deked left, and Mitchell bit; that was enough for Carr to think he had the space to parachute a deep throw. The ball traveled 44 yards in the air, perfectly thrown and timed, and got to Cooper a second before the safeties converged for the tackle. “The level of difficulty on that throw is off the charts because of the danger involved,” said the last Raiders quarterback to win the MVP, Rich Gannon. I reached out to Gannon on Saturday to dissect the final drive. “Such a tough throw to make.” Gain of 39. • Second throw, fourth-and-11, Kansas City 42, 0:41 left. With nickel safety Eric Murray on tight end Jared Cook, Cook drags Murray on a short post from the left slot, and Carr hits him perfectly in a hole in the middle of the defense that—uncharacteristically for smart defenders like Kansas City’s—was just too big. Gain of 13. • Third throw, third-and-10, Kansas City 29, 0:23 left. The play looked ugly from the start, two Raiders receivers flooding the same area inside the 10 on the way to the left pylon. Carr let it fly, and Cook skied above three others (two Chiefs, one Raider) in his area to come down with it, and he sprawled into the end zone a yard to the left of the pylon. Replay would show him down at the half-yard line. “Unbelievable throw,” Gannon said. “The routes were run right; somebody got it wrong. But it’s right about that time you think he’s like Michael Jordan used to be at the end of games. You know, everybody get out of the way, get out of the lane. Let me handle this.” Gain of 28. • Fourth throw, first-and-goal, Kansas City 2, 0:00 left (untimed down). After three accurately called penalties turned the final seven seconds on the clock into some Bizarro Football World event, Carr lined up in shotgun. Michael Crabtree was the key receiver to his left, Cooper to his right. We’d learn this later, but the Oakland offense had a roll-right red-zone play in the game plan, but not a roll-left here. Carr thought it best—I’m assuming because he trusted the physical Crabtree on lesser cover men than Marcus Peters on Carr’s right. Carr took the snap and rolled left. “I was thinking when I saw that, ‘Oh no, what are they doing?’” Gannon said. “The sprint-right option is such a better play for him. On a scale of difficulty going to the left, it’s so easy to miss that throw, because it’s not a throw you normally make.” The throw was laid into Crabtree’s gut in the end zone, just beyond the left pylon. (Man, that pylon got a workout in the last 23 seconds.) The PAT gave Oakland a 31-30 win. The first victory of Carr’s career, in 2014, came over the Chiefs, after an 0-10 Raider start. Since then he’d lost to the Chiefs in all five starts—by 18, 14, six, 16 and eight points … 0-5, by an average of 12.8 points per start. The Raiders did. Their best chance for the playoffs with that brutal schedule down the stretch? Let Carr drive the team. Cowboys running back Ezekiel Elliott ranks fifth in the NFL with 90.0 average rushing yards per game. Ezekiel Elliott, running back, Dallas. 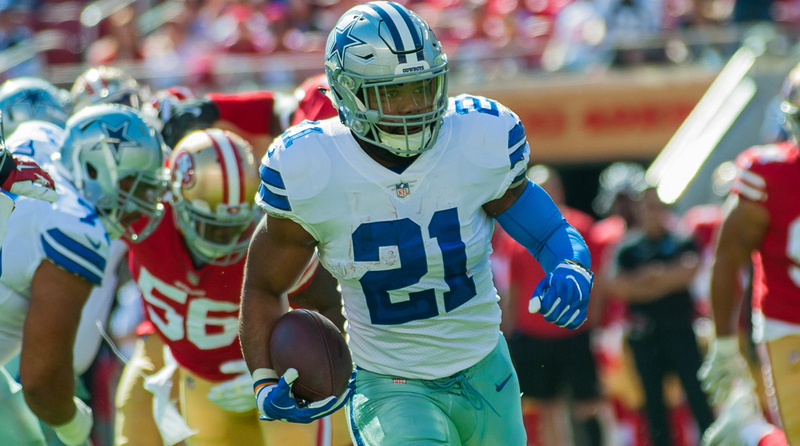 A dominant performance from the Cowboy on Sunday in a 40-10 win over San Francisco: 26 carries, 147 yards, two rushing touchdowns; and a 72-yard touchdown reception on a screen pass. Oh, and he barely played the fourth quarter. But don’t get too attached, Cowboys fans. If legal proceedings don’t go Elliott’s way this week or next, he still could be facing a six-game suspension. Derek Carr, quarterback, Oakland. 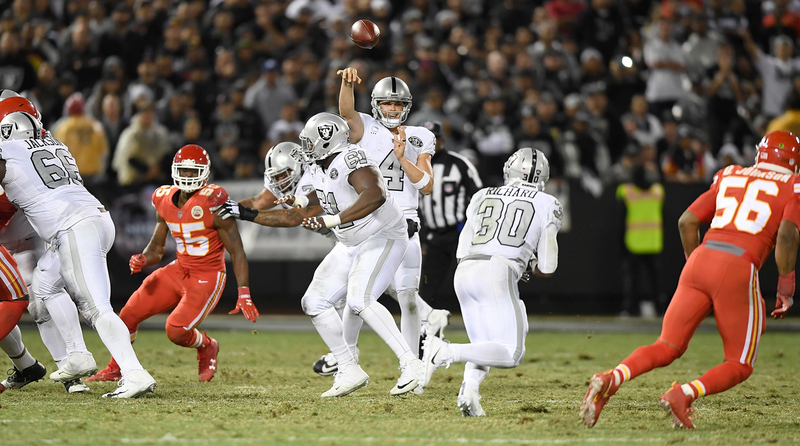 Seeming to be on his way to his sixth straight loss to division power Kansas City, Carr drove the Raiders 85 yards in the final minutes for a 31-30 win. His 417 yards, three touchdowns and no picks were vital in the Raiders having playoff hopes after seven weeks. Eddie Jackson, safety, Chicago. The rookie fourth-round pick from Alabama was the last of 10 Crimson Tide players drafted in 2017, but he made history Sunday against the Panthers. Jackson won a starting job in camp, and against Carolina he repaid the coaches for their faith in him. He scored two long touchdowns in the first 18 minutes of the Bears’ 17-3 upset win. Jackson ran 75 yards with a recovered fumble nine minutes into the game. And early in the second quarter he grabbed a tipped pass from Cam Newton and romped 76 yards down the right sideline. He’s the first player in the NFL’s 98 seasons to have two defensive touchdowns of at least 75 yards in a game, and he was the biggest factor in Chicago’s third win of the season. Yannick Ngakoue, defensive end, Jacksonville. The Jags may have missed badly on their quarterback of the future by picking Blake Bortles third overall in 2014, but through free agency and the draft, GM Dave Caldwell has built a deep and productive defense. Nobody’s ever heard of Ngakoue, a third-round pick from Maryland last year, but his 2.5 sacks led Jacksonville’s 27-0 shutout of the inept Colts. Kevin Byard, safety, Tennessee. He completes the Sunday Early Games Middle-Round Hall of Greatness. The third-rounder from Middle Tennessee in 2016 had the Titans’ first three-interception game by a defender in 10 years, helping surprisingly shaky Tennessee to hang on in Cleveland, 12-9. Byard had picks in the second, third and fourth quarters, and they were key because of where they happened: at the Tennessee 7, the Cleveland 41 and the Tennessee 8. Ryan Succop, kicker, Tennessee. Four times he broke a tie to put the Titans ahead in an offensively inept game at Cleveland. His 43-yard field goal put Tennessee up 3-0. His 23-yard field goal put Tennessee up 6-3. His 46-yard field goal put Tennessee up 9-6. His 47-yard field goal gave Tennessee a 12-9 overtime win. Justin Tucker, kicker, Baltimore. Watching Tucker, it’s an upset when he lines up for a 57-yard field goal and doesn’t make it. He kicked one of those, and a 48-yarder. And a 47-yarder. In a sport full of great kickers right now, Tucker is state of the art—and the best offensive weapon the feeble Ravens have. Travis Benjamin, punt-returner/wide receiver, Los Angeles Chargers. No. No. Please don’t say it. NO! The two biggest plays in the Chargers’ 21-0 skunking of division rival Denver Sunday came from … a former Brown. Remember Travis Benjamin? Johnny Manziel’s favorite receiver? The Browns let him walk to the Chargers in free agency after the 2015 season. On Sunday he sprinted through the Denver punt team for a 65-yard touchdown return to make it 7-0, then Benjamin caught the insurance touchdown pass from Philip Rivers, a 42-yarder, to make it 21-0. There’s a Travis Benjamin every week, it seems—a former Brown who made good on one of the other 31 teams. ​Josh McCown, quarterback, New York Jets. Love what he’s done for the Jets this season. But that floating pass in the final minute of the fourth quarter, trying desperately to break a 28-all tie, was right in the hands of Miami’s Brice McCain. That brain-lock pick—after a terrific first half and building a 28-14 lead on the road—handed Miami the win, 31-28, on an easy field goal. —Denver coach Vance Joseph, after the Broncos were blanked by the Chargers 21-0. It's the first time Denver has been held scoreless since Nov. 22, 1992. —Galynn Brady, Tom Brady’s mother, to husband Tom Brady Sr., during the Super Bowl when the Patriots trailed 28-3, as related by Galynn to Andrea Kremer for her NFL Network feature story Sunday morning. —Dallas quarterback Dak Prescott to Jenny Vrentas of The MMQB for her story on Prescott emerging as a cancer-fighting advocate, after the death of his mother, Peggy, from colon cancer. —Rams running back Todd Gurley, in London for Sunday’s Cards-Rams game, complaining about two western teams traveling to Europe to play a regular-season game. It’s 10.5 hours, according to FlightAware, to fly non-stop from Los Angeles to London. (And the Rams flew from Jacksonville anyway.) But I get Gurley’s point. Imagine how teams will feel in 2022 or 2023 when the NFL puts a franchise in London, and the London team has a real home-field advantage, welcoming teams that have to fly six to 10 hours to play in England. —Houston pitcher Lance McCullers to Fox Sports reporter Tom Verducci, after McCullers got his first career save with four innings of one-hit ball against the Yankees in Game 7 of the ALCS, a 4-0 Astros win. By Nov. 3, the Jets will have played five division games in nine weeks, and will be finished with their season series against Miami and Buffalo. By Nov. 3, the Falcons will have played zero division games. They have five NFC South games after Thanksgiving. It has been years since the Bears played such a Monsters of the Midway game. The two touchdowns scored in the Chicago-Carolina game were both defensive scores. Chicago quarterback Mitchell Trubisky threw seven passes. The Bears had five first downs. Chicago won by 14. Sept. 24: The Saints, with Peterson still on the team, depart Charlotte for an overnight flight to London after playing the Panthers. Duration: eight hours. They practice in London all week, then play Miami on Oct. 1. Oct. 1: After the win over the Dolphins, the Saints fly back to New Orleans (nine hours, 45 minutes) for their bye week. Peterson spends much of his time off in his home state of Texas. Oct. 10: Back in New Orleans to resume practicing for the Saints, Peterson instead is traded to Arizona. He flies to Arizona, moves into Larry Fitzgerald’s guest house, and begins to cram for his first game as a Cardinal, against Tampa Bay at home. Oct. 16: The Cardinals leave Phoenix for the 10-hour trip to London. Peterson says he’s able to sleep for much of way. Arrive on Tuesday the 17th and practice for the week. Oct. 22: After the loss to the Rams, Peterson and the Cardinals board the plane for a 10-hour, 45-minute flight to Phoenix. Peterson was scheduled to walk off the plane at Sky Harbor Airport at 6:30 a.m. ET Monday ... 30 days after his month-long odyssey began with a trip from one continent to another. This week in "That's So Browns"
Hue Jackson declines Taylor Lewan facemask penalty on 3rd and 1. Looks like we're gonna have to wait another year before inducting Sam Darnold into the Hall of Fame. I know Gabriel. I respect Gabriel. We’re halfway through the college season. I don’t know how you judge this class of quarterbacks until: a.) The season is complete and the full evidence is there; b.) We see who enters the draft. I doubt this class will go down as “very average,” but we’ll see. LA’s NFL attendance issues will be solved once there’s a new stadium = My wife and I will stop bickering once we have kids. We’ve got a new section of the column the year called My MVP, as part of The MMQB’s partnership with State Farm. Each week, I’ll ask an NFL person what his most valuable possession is, and why. Preamble: I am finishing a story on ESPN reporter Chris Mortensen’s battle with stage four throat cancer. Last week I spoke with Colts coach Chuck Pagano—who was diagnosed five years ago this month with leukemia—because he counseled Mortensen about what he was going to face early in his treatment in 2016. At the end of our conversation, I asked Pagano about a possession he valued highly. This week’s conversations: Veteran Packer reporter Bob McGinn of BobMcGinnFootball.com, and longtime Dallas play-by-play voice Brad Sham. • McGinn, on how he thinks Aaron Rodgers plays on the edge too much for a franchise quarterback: “Rodgers was off to a very good start. He led the league in touchdown passes [after five weeks] and he led the league in something else too—sacks taken. He had 19 and tied with him was Carson Palmer, the immobile one. By my count [Rodgers] also had been knocked down 16 times. If you look at his record in both those categories throughout his career, they are both high. He holds the ball, he takes a lot of sacks, and when he extends plays, he lives a very dangerous life out there. Now this play in question, everybody does this type of thing, it's an escape right, you throw the ball, you get hit by an extremely fast linebacker. But I want to bring a play up in the [Week 2] Atlanta game. They are down 11 with a minute left and the ball is on the Green Bay 12. This game is over; it's garbage time. From shotgun, there's pressure in the middle and he spins out to his left. Just dump the ball, right, Peter? … He holds it for 5.1 seconds and here comes Adrian Claiborne and absolutely levels him. The pass flutters incomplete. He just gets drilled at the goal line. Now … he's extremely tough, but this stuff, he takes too many chances for his own safety and for the health of the franchise. The law of averages can catch up to you every three or four years—the  broken collarbone, and now this one!" 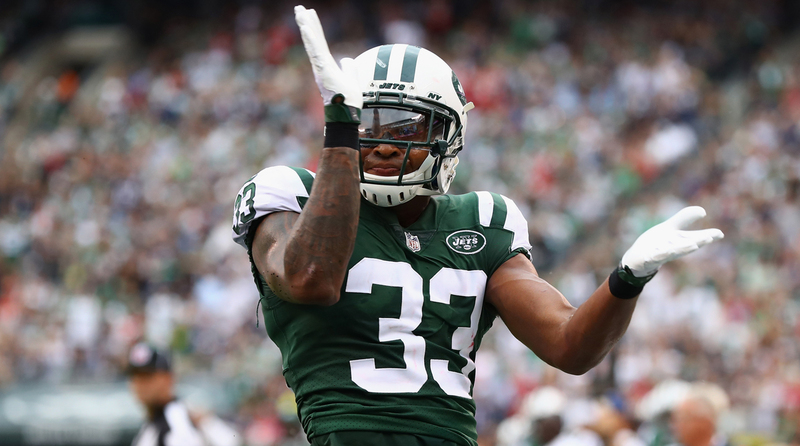 Jets rookie safety Jamal Adams, the No. 6 overall pick in the 2017 draft, is not lacking for confidence in his ability to play football. • Adams has played seven NFL games. • His coach, Todd Bowles, already changed the position in Arizona (and then some with the Jets) by turning hard-hitting safeties into linebacker/safety combo-platters by playing some safeties consistently close to the line in place of inside ’backers. a. A shame, of course, to see Carson Palmer go down with a broken left arm, maybe for the season, and maybe for his career. He turns 38 in December. Tell you what I'd do if I were Arizona GM Steve Keim: bring him back for one more tutoring/playing season, and draft his heir in the top 10 next April. Because it certainly looks like the Cards will have a top-10 pick after that putrid showing in London. b. This has to be a record, part 1: After seven weeks, every team in the AFC has at least two losses. This has to be a record, part 2: Only one team entering the final game of Week 7 (the 5-1 Eagles, and that could change after the Washington-Philly Monday-nighter) in the 32-team league has zero or one loss. c. I did not see Buffalo and Tampa Bay combining for 50 first downs and 881 total yards, I’ll tell you that. d. Great graphic by NBC Sunday night, showing the release time of Tom Brady and Matt Ryan … an identical .33 seconds by both. e. Most amazing defensively deficient play of the season (and stunning that it happened to the disciplined Bills): Jameis Winston floated a bomb down the left sideline in Buffalo for a touchdown to O.J. 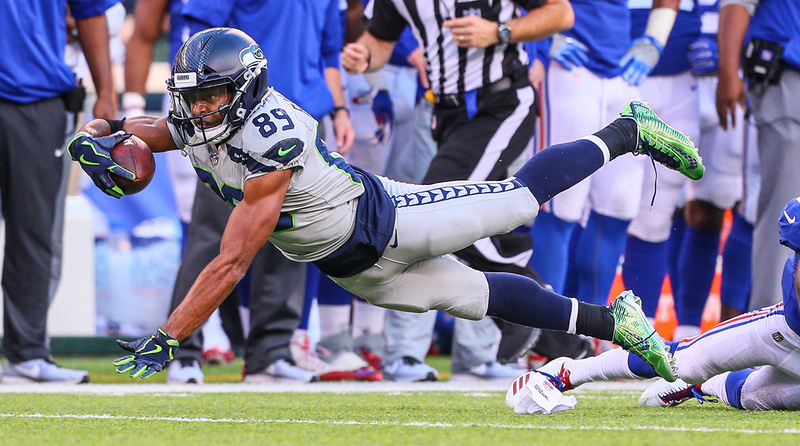 Howard—and there was not a Buffalo defenders within 18 yards of Howard. f. Good diagnosis by Chris Spielman of Fox, ripping the Dolphins for trying to strip the ball instead of trying to tackle Matt Forte as he converted a long third-down pass into a first down. g. Chiefs are still 12-1 in their last 13 AFC West games. h. But giving up 32 first downs and 505 yards … I mean, I give up. Is there a best team in football right now? i. Good for you, Chris Long, donating your entire 2017 base salary ($1 million) to education causes. j. The desperate Bruce Arians is the best Bruce Arians. Down 13-0 in the first half against the Rams, Arians went for it on fourth-and-one from his 35, and made it. k. Todd Gurley is a terrific and elusive receiver. Amazing that the Rams never thought of featuring him that way in his first two seasons. l. Gregg Doyel of the Indianapolis Star took a blowtorch to the Colts after the team got shut out for the first time in the regular season since 1993.
m. I know the way Jim Irsay thinks. And firing Chuck Pagano during the season would not surprise me. 3. I think I feel sorry for England. Poor England. First Brexit. Then ridiculously non-competitive football. Now, to the rescue … the Cleveland Browns? Three of the four London games have been played this year, with one remaining: Minnesota (5-2) versus 0-7 Cleveland on Sunday at Twickenham Stadium. The NFL sold out all four games, and the average crowd at the four games will be more than 78,000. As for the quality of play: It has stunk. Margin of victory in the three games this year thus far: 37, 20 and 33 points. At some point, the NFL’s going to have to play a really good game in London, not just a regular-season game for regular-season’s sake. Green Bay needs to go. Philadelphia hasn’t been. Next season will be eight years since the Broncos made the trip. It’s only right that the fine people of Western Europe see some of the best teams in the league, with something on the line. 4. I think that was a touching, lovely ceremony the 49ers put on for former wide receiver Dwight Clark, who has ALS and appeared with 37 of his former teammates at halftime of, fittingly, the Dallas-San Francisco game Sunday in Santa Clara. When the team asked him what he wanted to do, seeing that so many people wanted to see him and honor him, Clark said, “I just want to see my teammates.” As Clark said Sunday: “And the 49ers heard that and flew in all these players so I could see them one more time.” With his strength in decline and struggling with his speech, Clark thanked his mates and his fans in an emotional speech that brought owner Eddie DeBartolo to tears. I have a feeling he wasn’t the only one. Now, I know Ike Taylor, but not well. I’ve always found him to be a reasonable guy. But these are two minutes of television that do not make him look good, or reasonable. One: You do not run off the bench into a skirmish for any reason. Two: You do not make contact with an official for any reason. Three: Regarding the you’re-not-thinking-in-the-heat-of-the-moment response: Really? What do coaches at every level tell you about fighting, about altercations on the field, regardless who’s right or wrong? They tell you: Walk away. Be smart. Don't take the bait. Don't get a penalty. Thinking is very much a part of football. So now here’s what we’re left with Lynch, who showed Taylor “growth”: By running onto the field and making contact with an official, he missed the second half of a game the Raiders absolutely had to win, and he was suspended for another game vital to the 3-4 Raiders—at Buffalo next week. (He has appealed the suspension, but let’s assume he’ll serve the game.) In two crucial games, Lynch’s irresponsible action removes a vital player from six of the eight quarters. That’s a heck of a price to pay for such great mediation. 6. I think I love when the media—in this case the Fort Worth Star-Telegram—digs through the archives to find something that at one point would have been casually interesting but now seems incredibly so. The newspaper discovered a reader letter to the editor from 1989, criticizing Jerry Jones, in his first game as owner of the Cowboys, for sitting with Elizabeth Taylor during the national anthem. Aside from how surprising that would be in any case, it is especially notable given how Jones says if any player does not stand at attention for the anthem, he won’t be playing for the Cowboys. Well, if an owner sits for the anthem, does it mean the owner will not own for the Cowboys? 7. I think I got this question, in a few forms, during the week after commissioner Roger Goodell said he wants all players to stand for the anthem, but was not going to force them to do so: Why won’t the NFL just make a rule for the players to stand? It’s pretty simple. So far this weekend, approximately 1,350 men have been scheduled to be on the sidelines at 14 games for the national anthem. (Washington and Philadelphia will make that 15 games and 1,440 players total tonight.) Of the 14 games, 15 uniformed players demonstrated either by sitting (10), kneeling (one), staying in the locker room during the anthem (one) or standing in the tunnel (three). That is 1.1 percent of the players in the NFL not standing for the anthem the way Goodell (and the networks and the advertisers) would want. Had Goodell issued an edict that all players must stand, and those who do not will be sanctioned either with a fine or suspension, I can tell you there would have been scores of players either sitting or kneeling or performing some sort of civil disobedience for the anthem. What would that have solved? 8. I think it’s a little early to declare Andrew Luck out for the season, or to say he shouldn’t play the rest of the year because his shoulder’s not right. That’s a decision that doesn’t have to be made now, first of all, and if Luck is healthy enough to play, say, by Thanksgiving, and the Colts are a game out of first in the AFC South, well, why would you not consider him an option? Even if Jacoby Brissett is playing well enough and winning games, who would you have rather have in relief if Brissett struggles or is hurt—Scott Tolzien or Andrew Luck? a. RIP, Bob Sprenger, one of the best PR people the NFL has had. Sprenger was a stalwart in the formative years of the Chiefs. b. You tell ’em, Sam Ponder. Do not let cretins get away with personal attacks of the Howard Stern kind. d. TV Story of the Week: by Steve Hartman of CBS News, on the life and times of Chris Rosati, who died last week of ALS; Rosati’s zest for life reminds me of Steve Gleason’s. e. I so value public radio. Check out this story from New Hampshire Public Radio by a man, a heroin addict, who says, “I’m not an addict,” and two weeks later, he was dead. Such important work—helped by the video the addict himself shot. f. Fun being on TV with Nicole Wallace of MSNBC last Wednesday. g. Hey: I shared a spin class with Samantha Bee in New York City on Saturday morning. h. Daniel Murphy undergoes microfracture surgery on his knee. That’s no run-of-the-mill surgery, Nats fans. i. I’ll take the Astros over the rested Dodgers in seven. I hope it’s seven, and I hope the drama is a replay of the Astros-Yankees series. j. I have never seen an infielder-to-catcher tag play at home as beautiful and timely as the Alex Bregman-to-Brian McCann play in the fifth inning of Game 7 of the ALCS. How McCann held on and tagged in a zillionth of a second is beyond me. There were some superior defensive plays in that series, particularly by Aaron Judge and Jose Altuve, but that tag of Greg Bird at home was the best one. l. Aaron Judge, AL playoffs: 48 at-bats, 27 strikeouts. And still what an impact he made against the ’Stros. m. Todd Frazier is the best third-base security blanket in baseball. o. Jeff: Believe me, when I’m off the BDL (Beer Disabled List) after Sober October, and when I get back to Cleveland, BottleHouse will be on my list. Thanks a lot. p. Stop the planet. I have to get off. Columbia’s football team is 6-0. Philadelphia 23, Washington 20. I love this game. It could be a bombs-away affair, but I think more likely the two play-callers will lean on ball-possession to win. The Eagles, with a dominating possession time (34:23) and resurgent back, have the edge. Since being invisible in the season’s first two weeks, LaGarrette Blount has rushed for 67, 136, 74 and 67, respectively, yards in the Eagles’ four-game win streak. “I never questioned that I’d have a big role here,” said Blount, whose 5.6-yards-per-rush this season is a career-best. “We didn’t play much as a first unit in the preseason, and it’s taken a while for some of the new guys to get their legs under them. But right now, I love it. The offensive line feeds on how I run the football. They obviously know that my game is to break tackles. They know I’ll make the right reads. They’re a great line.” They’ll need to be tonight. Washington’s allowing just 88 rushing yards per game.